So says John Lasseter, director of "Toy Story" and "A Bug's Life," about Hayao Miyazaki. Other animators agree that the quiet man from Japan with the mop of grey hair may be the best animation filmmaker in history. His films are so good they force you to rethink how you approach animation. Lasseter is one of the most successful animators in Hollywood. That he would take time to personally shepherd Miyazaki's "Spirited Away" into a release by Walt Disney is a tribute to the older craftsman. The movie opens on Friday. Lasseter, who directed the English-language soundtrack for the film, joined Miyazaki at the recent Toronto film festival. "The very first screening of 'Spirited Away' outside of Japan was at the Pixar animation studios," he said, "and I was stunned at how amazing this film was. 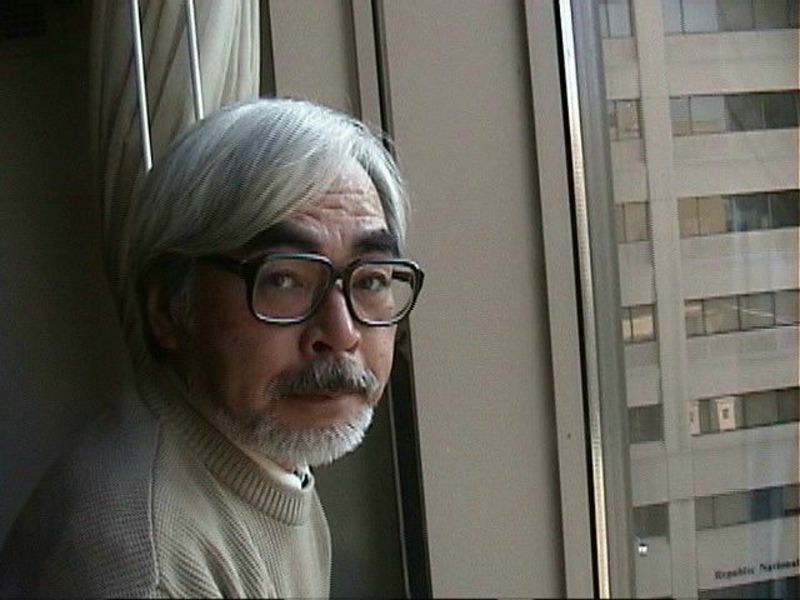 North America hasn't had a chance to discover Miyazaki's films. In the animated community he's a hero, like he is to me." Miyazaki and his partner at Studio Ghibli, Isao Takahata ("Grave of the Fireflies"), have created work of astonishing depth and artistry; his "Princess Mononoke" was one of the best films of 1999. "Spirited Away," which won the Berlin Film Festival, has passed "Titanic" at the Japanese box office and is the first film in history to gross $200 million before even opening in North America. The new film, which may be his best, tells the story of an 10-year-old girl and her parents who wander into a tunnel in the woods and find what looks like an amusement park. It turns, for the girl, into a "Alice in Wonderland"-type adventure, populated by a sorceress, ghosts, spirits, two-eyed dust balls, a helpful young boy, a boiler-room man with eight limbs, and a fearsome river creature whose body has sopped up decades of pollution. When I went to talk with Miyazaki, who is 62, I reminded him that in 1999 he said he was going to retire. Now here was another film. "I wanted to retire," he said, "but life isn't that easy. I wanted to make a movie especially for the daughters of my friends. I opened all the drawers in my head they were all empty. So I realized I had to make a movie just for 10 year olds, and 'Spirited Away' is my answer." Revealing. Many directors pitch their movies at 10-year-olds and then claim they are for the "whole family." Miyazaki makes a film that adults found fascinating at the Berlin, Telluride and Toronto festivals, and claims it is for 10-year-olds. Speaking through a translator, he said Lasseter "turned into a human bulldozer" to assure the American release: "Without him I don't think we'd be sitting here." Miyazaki, who is suspicious of computers, personally draws thousands of frames by hand. "We take [handmade] cell animation and digitize it in order to enrich the visual look, but everything starts with the human hand drawing. And the color standard is dictated by the background. We don't make up a color on the computer. Without creating those rigid standards we'll just be caught up In the whirlpool of computerization." He grinned. "It was an absolute order from the commander." He is the commander. He defines hand drawing as "2-D" and computer animation as "3-D." "What we call 2-D is what we draw on paper to create movement and space on a piece of paper. The 3-D is when you create that space inside a computer. I don't think the Japanese creative mind is very suited for 3-D."
I told Miyazaki I love the "gratuitous motion" in his films; instead of every movement being dictated by the story, sometimes people will just sit for a moment, or they will sigh, or look in a running stream, or do something extra, not to advance the story but only to give the sense of time and place and who they are. "We have a word for that in Japanese," he said. "It's called ma. Emptiness. It's there intentionally." Is that like the "pillow words" that separate phrases in Japanese poetry? "I don't think it's like the pillow word." He clapped his hands three or four times. "The time in between my clapping is ma. If you just have non-stop action with no breathing space at all, it's just busyness, But if you take a moment, then the tension building in the film can grow into a wider dimension. If you just have constant tension at 80 degrees all the time you just get numb." Which helps explain why Miyazaki's films are more absorbing and involving than the frantic cheerful action in a lot of American animation. I asked him to explain that a little more. "The people who make the movies are scared of silence, so they want to paper and plaster it over," he said. "They're worried that the audience will get bored. They might go up and get some popcorn. But just because it's 80 percent intense all the time doesn't mean the kids are going to bless you with their concentration. What really matters is the underlying emotions--that you never let go of those. What my friends and I have been trying to do since the 1970's is to try and quiet things down a little bit; don't just bombard them with noise and distraction. And to follow the path of children's emotions and feelings as we make a film. If you stay true to joy and astonishment and empathy you don't have to have violence and you don't have to have action. They'll follow you. This is our principle." He has been amused, he said, to see a lot of animation in live-action movies like "Spider-Man." "In a way now, live action is becoming part of that whole soup called animation. Animation has become a word that encompasses so much, and my animation is just a little tiny dot over in the corner. It's plenty for me."